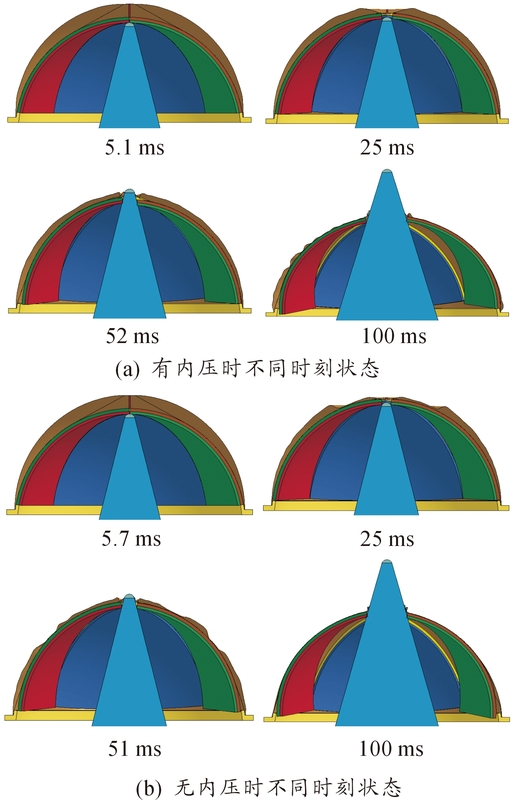 Citation format:LU Yu, YANG Yang, ZHAO Zheng.Simulation Research on Impact Force of Underwater Vertical Launching Warhead[J].Journal of Ordnance Equipment Engineering,2019,40(2):19-21. Abstract: A finite element model of the underwater vertical launching device, considering the influence of the inner pressure of the outer layer of the underwater vertical launching hood on the cracking process and impact force of the hood was established based on ANSYS/LS-DYNA. The internal pressure and no internal pressure was solved separately, and the calculation results were compared and analyzed by post-processing software LS-PREPOST. The results show that the maximum impact force between the warhead and the buffer layer under internal pressure and no internal pressure conditions is 1 186 N and 1 205 N respectively during the ejection of the warhead, and the maximum impact force between the warhead and the outer layer of the hood is 108 N and 110 N respectively. The uniform internal pressure on the inner side of the outer layer of the hood has little effect on the impact force. DYMENT A，FLODROPS J P，PAQUET J B，et al.Gaseous Cavity at The Base of An Underwater Projectile[J]. Aerospace Science and Technology, 1998(8):489-504. 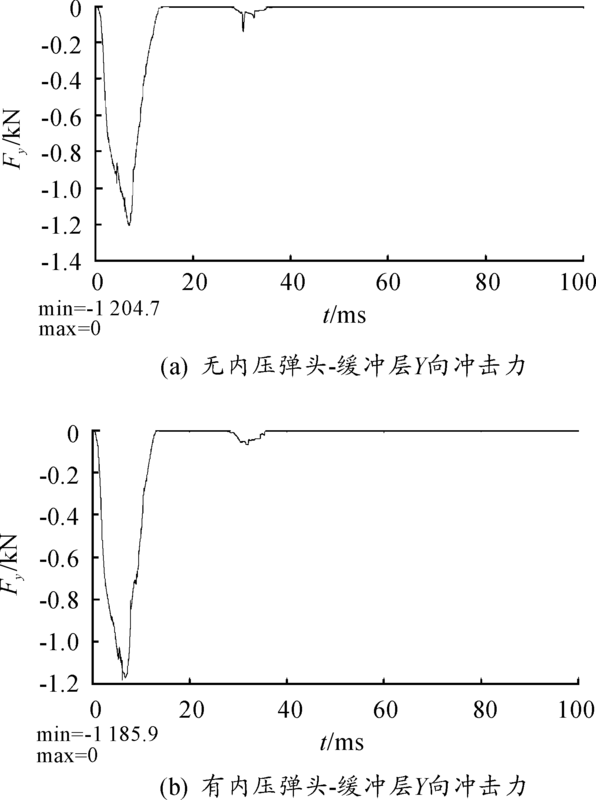 KUNZ R F,LINDUA J W,GIBELING H J,et al.Unsteady,Three-dimensional Multiphase CFD Analysis of Maneuvering High Speed Supercavitating Vechicles[C] //Proceedings of the 41st Aerospace Sciences Meeting and Exhibit,Reno,Nevada:AIAA,2003:841. YAGLA J J.Launch dynamics environment of a water piercing missile launcher[C]//Proceedings of the 24th international symposium on ballistics.New Orleans，LA: NDIA，2008: 1-17.